Nestled in a residential development in the heart of Sandton, this newly built residence has private access to the neighbouring re-developed 12 hectare Inanda Polo Club precinct and its facilities. The property is located on a relatively tight site with an exceptionally long street front, boasting a full eastern elevation over the polo club in the distance. The layout consists of three barns placed rhythmically over the site, and placed in such a manner to celebrate the existing established trees. Each “barn” houses its unique function, playing on Louis Kahn’s “served vs. servant” spaces. These 3 barns are connected by concrete slabs that house the residence’s main circulation spine. Areas such as the entrance hall with a gallery on the timber-clad bridge and a hanging steel and concrete staircase are found along this spine. All private living areas are flooded with light through the glazed gable ends on the first floor. In addition to the strong barn forms on site, there are two silos and timber boxes clipped onto the main façade of the house. These additions house the more informal functions such as a pool cloak, sauna, elevator and staff quarters. As a post-rationalized thought, the client mentioned that these forms reminded him of the Irish round towers of his homeland, where monks had to take refuge from the Vikings. 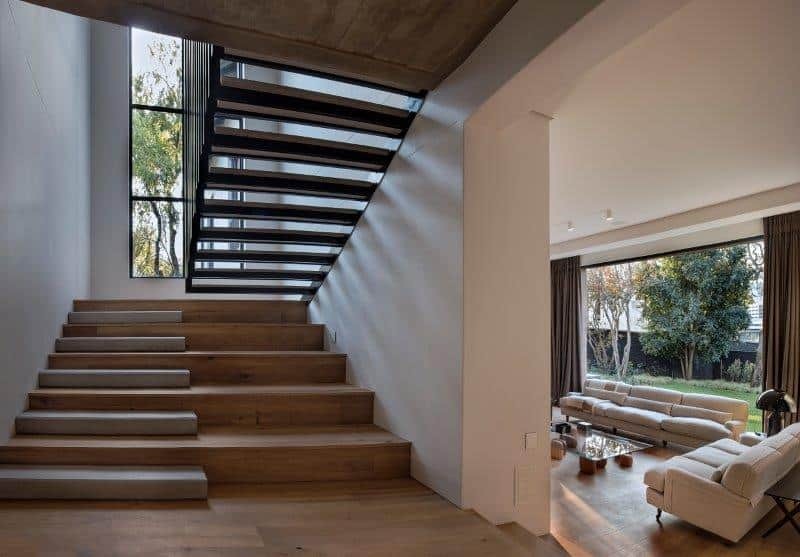 The idea of a vernacular South African living space plays heavily on the notion that no clear distinction exists between the interior and exterior. This idea is supported and realised by the use of huge glass panels, doors, windows and cavity sliders. Areas such as the covered terrace open up to the north and south to allow the client to experience the pool, courtyard and garden while entertaining. A natural and textured floor finish links the different spaces together and contributes to the idea of indoor-outdoor living. In the winter months, the wine cellar located under the main barn is the perfect unwinding spot.